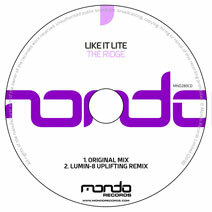 Like It Lite is back on Mondo Records with another slice of summer inspired progressive trance in the form of 'The Ridge'. Following in the footsteps of his debut single 'Juice', the latest single from Like It Lite is another fine execution and one that we know you're going to love. The original is a silky smooth progressive affair, packed with a lush groove and playful melodies, something which we loved when we first heard the track. Particularly that sumptuous breakdown bringing it all together at the drop. Remix duties fall to Lumin-8 who is no stranger to Mondo Records after delivering his blistering remix of Atherium's 'Sand (In The Hourglass)'. He returns for another outing and boy does not disappoint. Taking the original in a more energetic direction, Lumin-8 kicks it up a few notches and delivers a lush uplifting interpretation. Massive! Like It Lite returns to Mondo Records with another slice of progressive trance that'll leave you wanting more. After his previous outing 'The Ridge' created a buzz, the follow up s..